How to do Live Blogging in Blogger Live blogging is a kind of a blog post that is intended to provide live feeds or updates in form of rolling text of ongoing events similar to a radiocast, a live streaming and etc. These days live blogging is being adopted by many news portal websites who provide live feed updates of sports, technology, social media and etc. Recently, one of user sent us a query that how to do live blogging in blogger? There are numerous ways to do live blog . 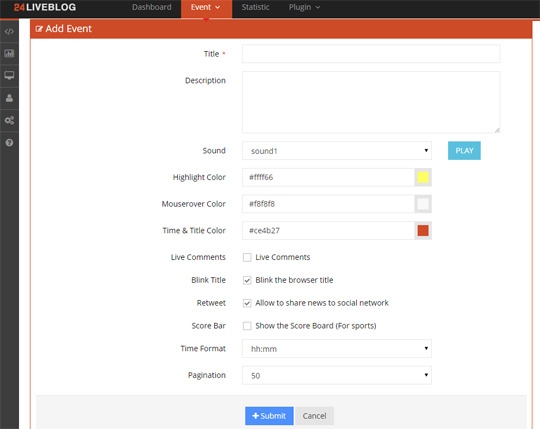 In this article, we will show you how to do live blogging in blogger. Live blogging is a kind of a blog post that is intended to provide live feeds or updates in form of rolling text of ongoing events similar to a radiocast, a live streaming and etc. These days live blogging is being adopted by many news portal websites who provide live feed updates of sports, technology, social media and etc. Recently, one of user sent us a query that how to do live blogging in blogger? There are numerous ways to do live blog . 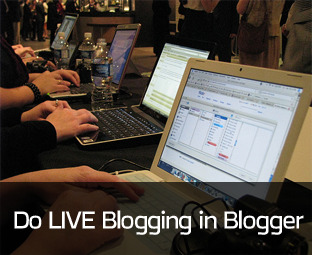 In this article, we will show you how to do live blogging in blogger. Did you know? BBC uses the term "live text" for hosting its own live blogging events. What is a Live Blog? How to Do Live Blogging in Blogger? 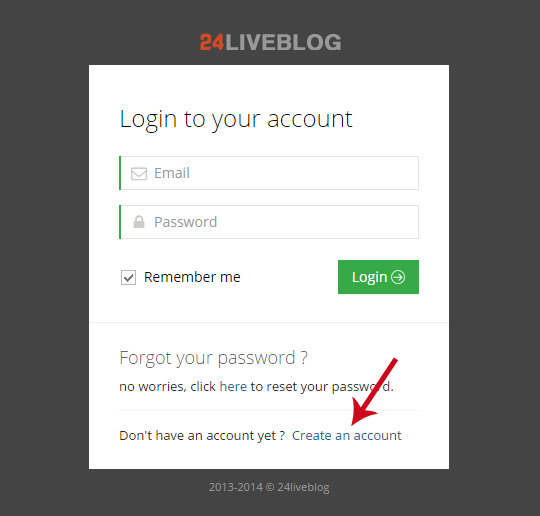 The first thing you need to do is to go to 24LiveBlog.com and select “Create an account”. 24LiveBlog.com is a website that provides a flexible live blog widget for blogger sites with flexible features and unlimited usage for free. While signing up you need to fill necessary details like username, password, name and working email address. Once you’re successfully able to create an account, you will automatically be redirected to the admin dashboard (screenshot attached below). 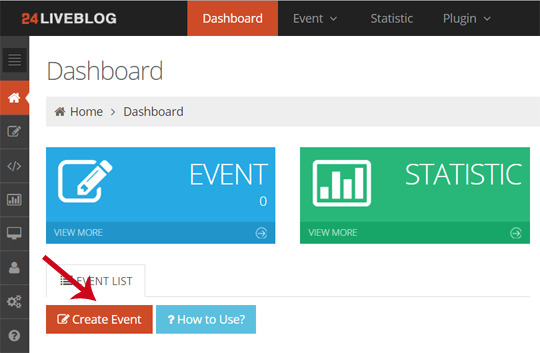 From admin dashboard, you can create live blog events, manage them, check statistics of events and can even view the details of users viewing your live blogging event. Now to create a live blog event, select the red “Create Event” button located on the admin dashboard as it can be seen in the screenshot below. Title: In this text area you’ve to insert the title of your event, it could be anything related to event you’re hosting for example, iPhone 6 Press Release Live Updates. Description: With relevant to title, enter a suitable description. Live comments: If you want your users to be able to comment, then check (tick) the live comment box. Customization Options: You can customize the look of the live feed by changing the highlight color, mouser over color, time and title color. Time format: You can also change the time format to suit the needs of your users or event. Once you are done customizing your event details, scroll down to the bottom of the page and press "Submit" to proceed to the next step. Don't worry, we are almost done ready to host your first ever live blogging event. After successfully filling the above form, you will be taken to a page from where you can push new updates to your live event. 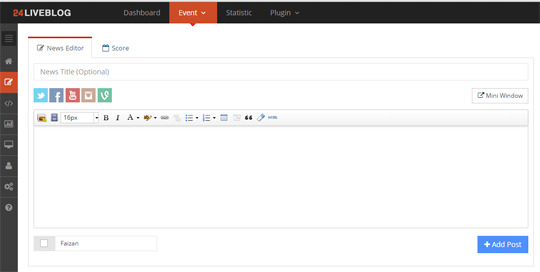 In the screenshot below, you can notice a simple text editor consisting of title, post content and "Add post" button. You can follow the same lead that you use while writing new posts normaly at your site but this time around your all updates would be concise and consistent. Before you can start live blogging, its time to place the event embed code on your blog so that your readers can easily access it. On the right side of your screen you’ll notice an “Embed Code” button, select and proceed to the next step. 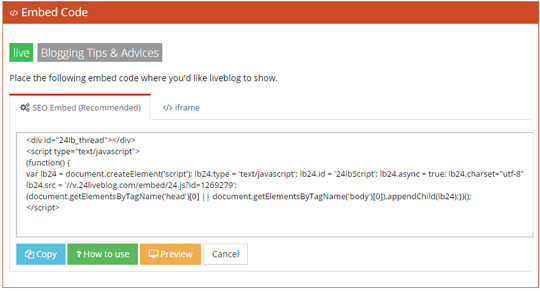 Copy the embed code then go to Blogger >> Pages >> Add new Page >> revert to EDIT HTML Tab and paste the code. Put the title of the page according to your desire needs and publish the page. Congratulations: You have sucessfully added a live blog event to your blogspot site. You can post unlimited posts, updates with no limitations at all. You can access the admin dashboard at http://admin.24liveblog.com to either edit or push new updates to your live event. We hope this tutorial may have everyone who kept on guess about how to do live blogging in blogger. 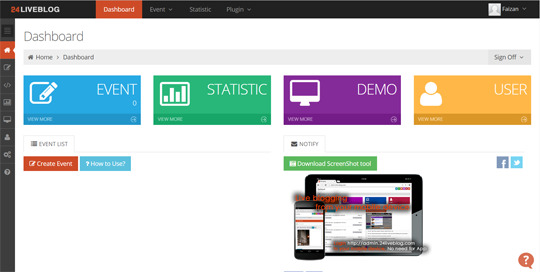 Do share try this free widget, and let us know what are your reviews about it? Does live blogging could be the next big thing? Does live blogging should be the modern way of blogs? If you like this article share it with your freinds on Facebook, Google+ or Twitter.